Novelist Jane Austen will soon become the latest historical figure to be honored on a British banknote, and the Bank of England has revealed an early run of the printed bills. Tuesday is the 200th anniversary of Jane Austen's death. The author of classics like Pride and Prejudice, Sense and Sensibility and Emma will take the place of biologist Charles Darwin on the £10 note. The Jane Austen tenner is expected to come out in September, 2017. The central bank has printed an initial run of a billion of the new notes, which are known in Britain as "tenners", after last year's launch of a five pound note made from a polymer film that the BoE said is more durable and harder to forge. (...) The writer was buried in Winchester Cathedral in 1817 and completed many of her best-known works such as "Pride and Prejudice" and "Emma" in the nearby village of Chawton. 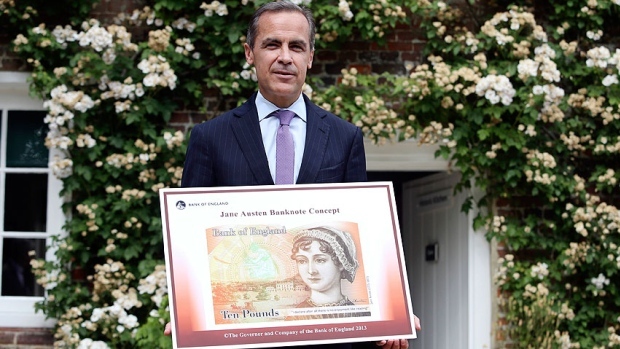 "Ten pounds would have meant a lot to Jane Austen, about the same as 1,000 pounds ($1,300) would mean to us today," BoE Governor Mark Carney said at the launch of the new note in Winchester. Austen received a 10 pound publisher's advance for her first novel and the new banknote bears a quotation "I declare after all there is no enjoyment like reading!" from her later work, "Pride and Prejudice". The quotation came from a character who in fact had no interest in books and was merely trying to impress a potential suitor. It drew a mix of amusement and criticism in the media when it appeared on an initial design of the note in 2013.